What is your Personal Assumptions Quotient? “The Right Fit Method Gets Personal: What is your Personal Assumptions Quotient (PAQ)?” On WIN Without Competing! Dr. Arlene will demonstrate how her Right Fit Method gets personal and disclose when erroneous assumptions about our personal lives can be detrimental to achieving and maintaining happiness. During the show you can take Dr. Arlene’s PAQ Quiz and find out what assumptions you should not be making and why. Dr. Arlene, with her guest co-host Virgil Holder, Director of Corporate Recruitment at the prestigious Piedmont Healthcare System in Atlanta, Georgia, will share fascinating stories about the impact of making erroneous assumptions in our personal lives. 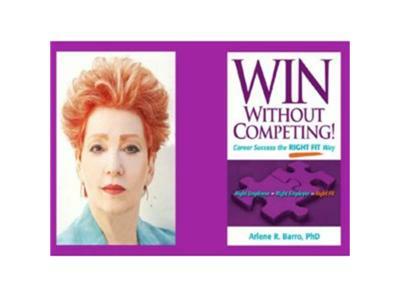 Dr. Arlene will respond to callers’ personal questions, demonstrating how the Right Fit Method, the subject of her book WIN Without Competing!, is the key to figuring out the right solutions not only in your professional life but also in your personal life.